Natahanael Greene was born in 1742 in Rhode Island to a Quaker farmer. Self-educated, Greene took charge of an iron forge owned by his family in 1770 while also beginning a career in politics in which he served in the Rhode Island General Assembly four out of six years. His introduction to military service came in August 1774 when he helped organize a local militia, known as the Kentish Guards. Despite a pronounced limp, he continued to serve with the militia and in 1775 was promoted to Major General of an army of Rhode Islanders raised in response to the siege of Boston. With the creation of the Continental Army, Greene was appointed brigadier and was assigned by George Washington to the command of the city of Boston. 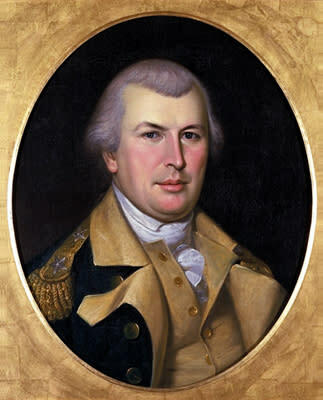 In August 1776, Greene was promoted to major general of the Continental Army and placed in charge of the troops on Long Island, though an illness kept him out of the fighting in the Battle of Long Island. He did see active duty at the Battle of Trenton, leading one of the two American columns in the decisive victory. During the Philadelphia campaign of 1777, Greene was again in the fight. He commanded the reserve at the Battle of Brandywine and again at the Battle of Germantown. During the winter encampment at Valley Forge, Greene was given the post of Quartermaster General, though he retained the right to command field troops, as he would again do at the Battle of Monmouth. Greene and Lafayette were later dispatched to Rhode Island for the failed Battle of Rhode Island, and he was again in command at the Battle of Springfield. In August 1780, he resigned his post as Quartermaster General. Greene was then given command of the Continental Army in the South, a place where the Americans had failed to gain a foothold. Under Greene&apos;s command, the Continental Army gained ground, eventually taking control of the southern colonies. Following the conclusion of the Revolution, Greene twice declined appointment as Secretary of War, settling for a life in Georgia. Unfortunately he passed away in 1786 at the early age of 43 after suffering from sunstroke.